I’ll be honest, I’ve never quite understood the need for hybrid bikes. While some say they offer the best of both worlds — the comfort of a mountain bike and the speed of a road bike — it all sounds a bit Pangloss from Candide to me. I was seeing the sluggishness of an off-roader twinned with the harsh ride of a drop bar bike. But perhaps I’m just a glass-half-empty kinda guy, and of course I was basing this on mere speculation. 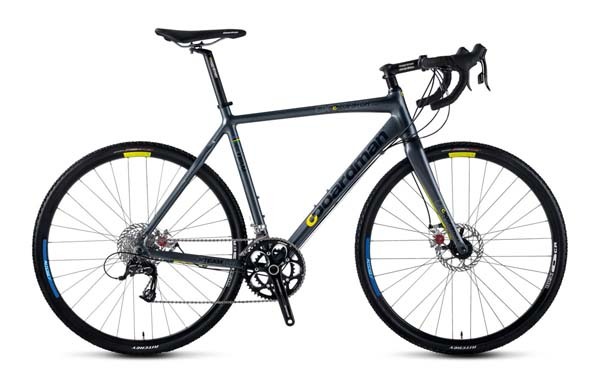 Would this new Boardman change my jaded view? The clean lines of the frame certainly help; it looks great and you find yourself tapping the frame as you ride wondering if it isn’t carbon-fibre after all. Where are the welds? It’s all smooth hydroforming, but you can find one if you look hard enough, tucked underneath the neat wishbone seatstays. Boardman certainly has worked hard to iron out the creases of the old model — the finish is just stunning. At the front, the head tube adopts a glamorous hourglass shape we really like, and emerging from that, the carbon fork carries the good looks with a clever disc mount that seems to morph from the fork itself — no need for the ugly adapter you normally need to mount a rotor. It’s let down a touch by the lack of internal cabling, which spoils some of the effect of the clean lines. 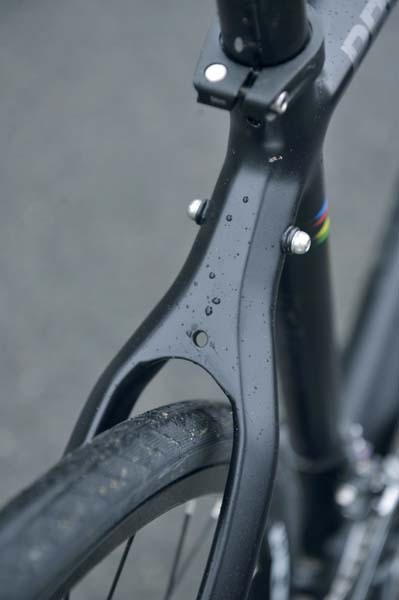 But perhaps Boardman wanted to keep things easy to maintain (internal routing can be a faff to replace) and besides, internal cabling is really all about streamlining, which can’t be a high priority on a hybrid. The drivetrain works flawlessly, with the SRAM Rival 10-speed DoubleTap shifting instantly understandable and with a great-feeling action. 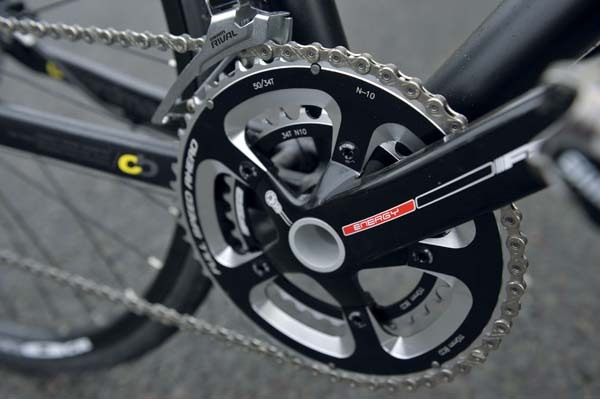 The crankset and BB30 bottom bracket prove a great combination and the whole package is as stiff as many a road bike. This thing really brings out the menace in you. I found myself bunny-hopping everything in sight, dropping off kerbs and trying to pull unwieldy wheelies down the road. Pathetic, at my age (nearly 30). But the sprightliness of the ride really makes you want to play around — it’s like being on a skinny mountain bike. Steering is incredibly sharp thanks to a short stem, narrow flat bar and the steep head angle. 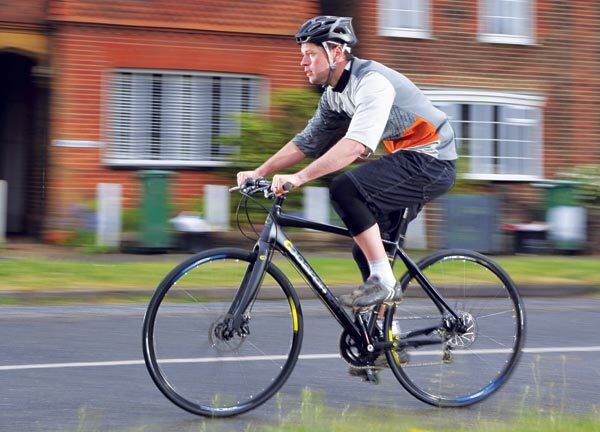 This isn’t necessarily a bad thing when filtering through traffic and changing lanes, but it could catch you out if you’d jumped straight off a mountain bike with wide bars and foolishly started pratting around. The Avid mountain bike brakes are quite simply exceptional. Overkill on the road? Most certainly, but ideal for low-maintenance riding or massive skids. You won’t stop faster on any bike, ever. Strangely though, it’s actually quite hard to drift the back end of the bike, probably because there is just so much rubber in contact with the road, compared with a skinny road tyre. So is it an easy bike to ride over long distances? The riding position is certainly comfortable, and the weight of the frame with the wheels off is extremely good, but the wheels drag things back down to earth. They’re too heavy — you can feel their pull if you get out of the saddle and sprint. Of course, this is the penalty you’re forced to pay with a hybrid — any lighter and they wouldn’t be the bombproof rollers they are and they wouldn’t stand up to light off-road use, either. As it stands, this thing will glide through potholes with a silky smooth ride. The Boardman is a great little package and, barring the wheels, it’s hard to fault it for what it is. I’m still not convinced a hybrid is really for me, but if you must have one you won’t go far wrong with this top-of-the-range option. And it just falls nicely within the Cycle to Work scheme budget, too. Chris Boardman is an Olympic gold medallist, world champion and world record holder (his ultimate hour record still stands). He briefly held the yellow jersey at the Tour de France both in 1997 and 1998, after time trialling to win the opening prologues. These days he puts together well specced and priced road, cross, mountain and hybrid bikes, he is a technical adviser to the GB track squad and an ITV cycling commentator. Go to www.boardmanbikes.com for more. This cyclo-cross bike has many of the same qualities the hybrid possesses, like the triple-butted alloy frame, carbon fork and disc brakes. It does have a drop bar, though, so it might make a better option if you’re not cutting through traffic on your rides. You could even dabble in cyclo-cross come next winter.